Since the middle of the 1970’s, the Middle East has had an increasingly significant influence on the development of the economy of South Korea. Before her trip to the region in 2015, the Ex-President of South Korean Park, Geun-Hye, described the Middle East as a potential “answer to our prayers for economic revitalization.” The development of this historical relationship allowed the Middle East to rebound from its oil crisis and created a vital connection that will remain intact for generations to come. The initial approaches to building a strong alliance between the Kingdom of Saudi Arabia and South Korea have been well-known and documented. In the mid-20th century, during the time of the Korean War, Saudi Arabia demonstrated its strong support for South Korea and its people. Eventually, on the 16th of October in 1962, this friendship led to the creation of diplomatic relations at the ambassadorial level between the Kingdom of Saudi Arabia and South Korea. Since that historical event, the two countries have kept a stable and supportive affiliation as partners both diplomatically and financially. By the 1970’s, the primary Middle Eastern trading partner of South Korea was Saudi Arabia. It became the country’s primary provider of oil; reaching an impressive total of $8,780 million (Korean Statistical Information Service). Another example of the fundamental and valuable relationship in Saudi Arabia was the creation of the Aramco Asia Korea Limited (Aramco Korea), established in 2012. Aramco Korea, a Korean company, with an expertise in providing infrastructure and support to businesses, joined with the Saudi Arabian Oil Company (Saudi Aramco). The national oil company in the Kingdom of Saudi Arabia and the world’s largest oil company by proven reserves was created to improve the collaboration between Saudi Aramco and its Korean consumers using the best advances in the business development and customer service. Not only do they provide a wide range of professional services for the Korean business community and support local businesses, but they are now an established global petroleum enterprise and a state-owned and valuable asset for the Kingdom of Saudi Arabia. In 2016 the overall two-sided market volume was US$ 29.04 billion with South Korea exporting such goods as cars, electronics, and steel to Saudi Arabia and importing oil and petrochemical products from Saudi Arabia to South Korea. In 2017, the two countries celebrated their 55 years of diplomatic relations. This unique relationship between these countries has improved remarkably over time. The professionals and scholars of the two countries have worked well and have learned to cooperate and create goods in all of the possible fields to move to increased growth and success each year. The connection between the two countries was elevated to a higher level when the Saudi government announced its Vision 2030 policy in April of 2016. Furthermore, in 2017, the governments of Saudi Arabia and South Korea announced the formation of two joint ministerial-level committees to increase mutual aid between the countries, and improve the business capacities. This policy would provide permanent assistance to the Kingdom’s Vision 2030 economic transformations, and South Korea became one of the critical partners in Vision 2030. The deputies of two countries mutually hosted a united committee meeting in October 2017, which presented the plan for 40 projects in five areas which would begin the implementation of Vision 2030. They would be: energy and manufacturing, smart infrastructure and digitization, capacity building, healthcare and life sciences, and SME’s and investments. Since then, South Korea has been named as an essential partner in Vision 2030; creating newly developed collaborative programs in a joint effort to bring to life and success to Vision 2030. 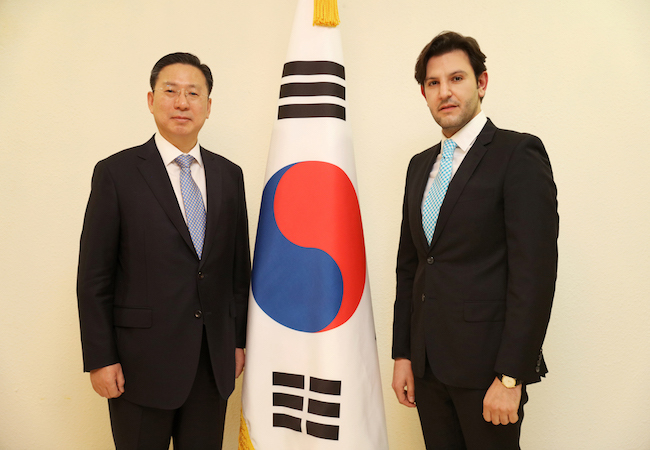 In a June 16, 2018 interview with Arab News, the new Ambassador JO Byung Wook, stated that the relationship between the two countries is exceptional for Korea and the goal of each side is to continue to strengthen the mutually beneficial partnership. His Excellency, the Ambassador of South Korea to Saudi Arabia was previously the Minister at the Korean Embassy in the United States. South Korea has an embassy in Riyadh and a consulate-general in Jeddah. A.W. On July 16, 2018, SPA-GCC Secretary General Dr. Abdullatif bin Rashid Al-Zayani received you and congratulated you on your appointment as your country’s Ambassador to the Kingdom of Saudi Arabia. You have discussed a desire for cooperative relations between the GCC and the Republic of Korea. As Ambassador, will you please explain your expectations and goals regarding this cooperation with the GCC and, particularly with Saudi Arabia? Amb. JO. First of all, it is my honor and pleasure to be appointed as the Ambassador of the Republic of Korea to the Kingdom of Saudi Arabia, the Land of the Two Holy Mosques. Since arriving in May, I have had fruitful talks on how to promote bilateral cooperation with high-level officials of the Kingdom and international organizations including GCC Secretary General H.E. Abdullatif Bin Rashid Al Zayani. For the Republic of Korea, the GCC countries, Saudi Arabia in particular are very important: indeed 60% of crude oil imports to Korea come from the GCC countries. Among them, Saudi Arabia accounts for the largest share. Moreover, in the 1970s to 1980s over a hundred thousand Koreans worked on infrastructure construction sites in Saudi Arabia. Close bonds were formed between our countries during that time. Here, in the Kingdom, one can see many landmark buildings and forms of infrastructure which were built by Korean companies such as, Ministry buildings, hospitals, universities, highways, airports and residential areas. My wish is to continue the legacy of this long history of economic cooperation between the two countries, not only in the areas of hydrocarbon energy and construction, but in other fields such as renewable energy, defense industry, healthcare, education and culture. Another important consideration is that the Kingdom is changing rapidly under the goals of the Vision 2030. It is my very special privilege and opportunity to see this change at the foremost seat as the Ambassador. Korea is one of the partner countries of Saudi Arabia for strategic cooperation, and I wish to find new realms to foster bilateral cooperation of even more diverse forms for the mutual benefit of our peoples. A.W. In your interview with Arab News on 16 July 2018, you stated: “Our two countries are now embarking on a journey of even closer friendship and sense of cooperation for the next half-century and beyond.” What are the primary conditions set forth that will continue this amicable relationship and continue to improve the friendship between the two nations? Amb. JO. Since the establishment of diplomatic relations in 1962 between Korea and Saudi Arabia, the achievements have been remarkable. This is clearly demonstrated in the fact that Saudi Arabia is the 9thlargest trading partner to Korea and Korea is the 5thlargest trading partner to Saudi Arabia. Moreover, Korea envisages great potential in the midst of the various transformations in the social and economic areas throughout Saudi Arabia under Vision 2030. In this regard, I believe it is very meaningful for the two countries launched the Vision 2030. 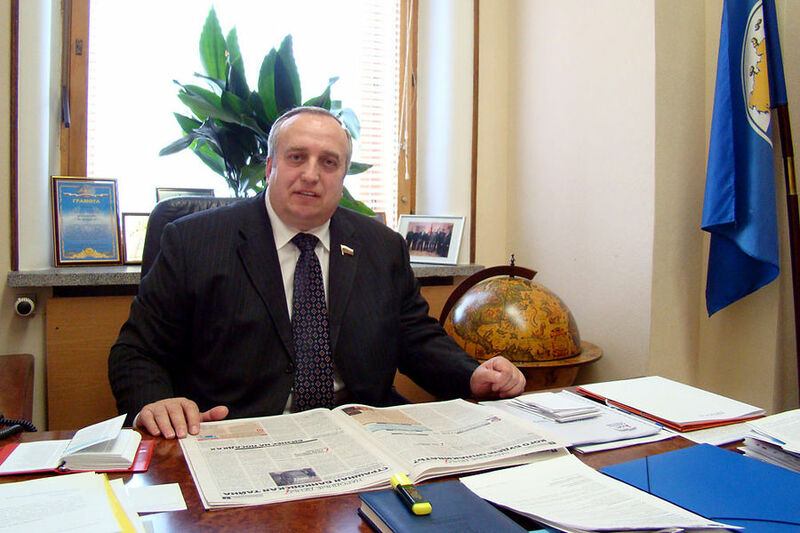 Joint Committee last year which has laid an institutional foundation of economic cooperation of greater substance. In addition, the thriving people-to-people exchanges serve as an important foundation for bilateral cooperation. Indeed, over a hundred thousand Koreans lived in the Kingdom in the 1970s and 1980s – and the bonds they formed and precious memories they have of that time stand as a solid foundation for bilateral cooperation. Recently, people-to-people exchanges have totaled approximately twenty-thousand people annually.One might say this fall somewhat short of expectations compared to an increasing scale of trade and economic cooperation. We hope to increase people-to-people exchanges between the two countries through the MOU on Facilitation of Issuance of Visit Visassigned last April. This is expected to come into effect in the near future, enabling people of the two countries to receive a multiple entry visa valid for five years. A.W. Few months back you hosted a dinner for a group of young Saudi residents who returned to Saudi Arabia after studying in several Korean universities. Can you discuss your feelings about their experience and emotions that were presented by these young professionals? How does spending time in a new country with different traditions and a different culture, change a young mind? How would an experience like this affect an adult; particularly an experienced professional like yourself? Amb. JO. I am convinced that communication with the next generation lies at the very heart of bilateral relations of the future. These Saudi youth, facing a culture and environment new to them, successfully settled in, and now they understand Korea and its social background, culture and people well. Each and every one of them has a valuable role to play. And I tried making them proud of it during the reunion dinner. They shared some creative ideas and suggestions which I found to be truly of tangible value. I was very impressed by their energy and enthusiasm. Korean pop culture, such as dramas, music, and movies, are becoming popular among young Saudi women these days. And I very much wish to create further opportunities for young people in Saudi Arabia to enjoy and share the Korean culture. A.W. On the 27th of October 2017, Saudi Arabia and South Korea signed the Memorandum of Understanding (MOU) to collaborate in the field of statistics. This purpose of this document, agreed to in Seoul, focused on an exchange of the administrative and technical experiences of both countries. In your opinion, what is the value of a memorandum; particularly this one? Amb. JO. Korea has established and managed a highly effective and modernized statistics system which has become increasingly important in our policy-making process. On the basis of the MOU on Statistical Cooperation signed last October, statistics management and technical know-how are to be shared with each other thereby contributing to advances in the statistics systems of both countries. To this end, Mr. CHOI SeongWook, Vice Commissioner of Statistics Korea visited Saudi Arabia to hold the first bilateral meeting with his counterpart on 12thand 13thof September. I trust that working together in the statistical field may even serve as a valuable model forshowing the way to diversifying cooperation between our two countries. A.W. Saudi Aramco signed a prominent Memorandum of Understanding (MoU) with the Korea Trade-Investment Promotion Agency (KOTRA) on July 18, 2018. The purpose was to foster a closer business collaboration under the framework of Saudi Vision 2030. What opportunities will this Memorandum bring to the bilateral relations of both the experienced and less experienced younger generation from both nations? Amb. JO.In April 2018, the MOU signed contract between the Korea Trade-Investment Promotion Agency (KOTRA) and Saudi Aramco laid a valuable foundation for cooperation in the fields of trade, investment, and human resources development. Accordingly, it is of great value in the pursuit of Saudi Vision 2030. To this end, KOTRA and Saudi Aramco will continue to explore the potential and possibilities of industrial cooperation and joint hosting of forums, seminars, or road shows. It is my wish the cooperation between the two sides will develop into platforms which generate a deeper interest in the Saudi market amongst Korean companies. This, in turn, will lead to investments and a host of new job and training opportunities for the young people of Saudi Arabia as well. In fact, I would like to emphasize that vocational training is one of the most promising fields for bonds of cooperation between our two countries. Approximately 65 Saudi doctors and dentists and 48 Saudi atomic engineers are being trained at the relevant Korean institutions. And after successfully completing their training, they are putting their expertise to real use in their respective fields in Saudi Arabia. A.W. According to “Dimensions International,” a periodical of Saudi Aramco, the issue from Spring 2018, Saudi Aramco joined with three maritime industry leaders. They were: the Dubai-based rig building giant Lamprell PLC, the Saudi national shipping company Bahri, and the Hyundai Heavy Industries (HHI), the largest shipbuilder and owner of the world’s largest shipyard in Ulsan, South Korea. From this merger, the joint venture International Maritime Industries (IMI) at the Ras al-Khair based maritime yard was formed. Their mission: to construct the first rigs and ships ever built in the Kingdom. This project is aimed to serve as a win-win project for all of the participants. What is your approach to a win-win economic scheme as a Diplomat and as a business venture? Amb. JO. Having met with many high-level officials since I came to Riyadh, I have repeatedly emphasized the theme of “Made with Saudi Arabia.” Thus far the focus in fostering cooperation between the two countries has been on what Korean companies can do “in” Saudi Arabia. But these times call for a change in approach by focusing more on what we can do “with” Saudi Arabia, leveraging the strengths of the two countries. Indeed, this is in tune with Saudi Arabia’s active efforts for a wide range of transformations under Vision 2030 in order to diversify its economy with the benefit of its great number of enthusiastic and talented young people. I believe Korea can be an optimum partner of Saudi Arabia, sharing its own development experience and technical know-how. The shipbuilding project in Ras Al-Khair is an unprecedented and historic challenge in Saudi Arabia. Hyundai Heavy Industries, Saudi Aramco, and other companies officially launched the joint venture company in late December 2017. This cooperation includes not only the construction of the shipyard but also shipbuilding, supplementary facilities and factories, and job training. In short, Korea and Saudi Arabia will work together from design and manufacturing to managing of the shipbuilding industry. I believe it promises to be a model project through which the two countries can set an excellent precedent for a win-win approach. A.W. The long-term goal of Vision 2030 has been said to have three key themes: foster a vibrant society, build a thriving economy, and result in an ambitious nation. What will be your approach to these themes and how will you reach those lofty goals? As a diplomatic partner for more than half a century, what are your expectations of Korea from Saudi Vision 2030 both as an Ambassador and as a business partner? Amb. JO. As I mentioned above, Korea sees the rapidly changing society and economy of Saudi Arabia under the implementation of Vision 2030 as an opportunity to expand and diversify bilateral cooperation. That is why the two countries identified 40 projects for partnership opportunities with the aim of realizing Vision 2030 in the First Saudi-Korea Vision 2030 Joint Ministerial Committee last October. These projects are in such fields as renewable and nuclear energy, smart infrastructure, healthcare, e-government, and human resources capacity-building. The two countries are currently consulting on holding the Second Joint Committee possibly this year. This year’s committee is expected to focus more on the details of how cooperation in these 40 projects can take concrete shape. 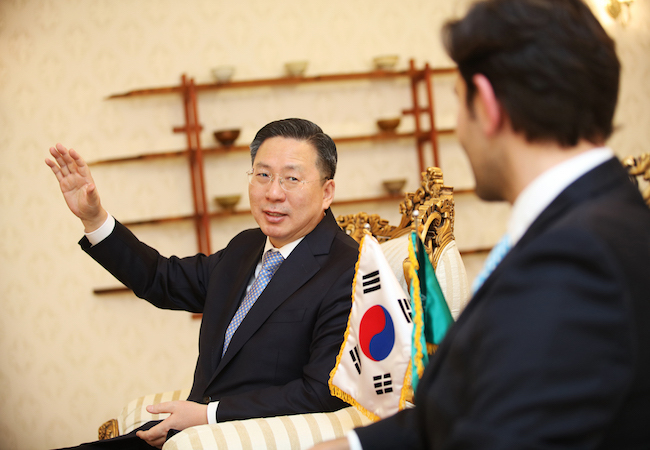 At the same time, bearing in mind a more business-friendly environment in Saudi Arabia is a key factor in attracting Korean enterprises, the Korean Embassy continues to talk closely with relevant Saudi authorities regarding trouble-shooting and assisting Korean enterprises in Saudi Arabia when they need help. And another thing I am very keen to do is to encourage the holding of more business meetings between the two sides. Upcoming forums and exhibitions – such as the Korea Nuclear Energy Road Shows and Healthcare Forum – are expected to be opportunities to inspire each other in finding valuable ideas for the further fostering of cooperation in the private sector.